Today, we announced the launch of a campaign to commit Massachusetts to meet 100 percent of its energy needs from clean and renewable sources. Clean energy supporters joined colleagues at Environment Massachusetts to unveil a bill that has more than a quarter of the state legislature signed on as co-sponsors. 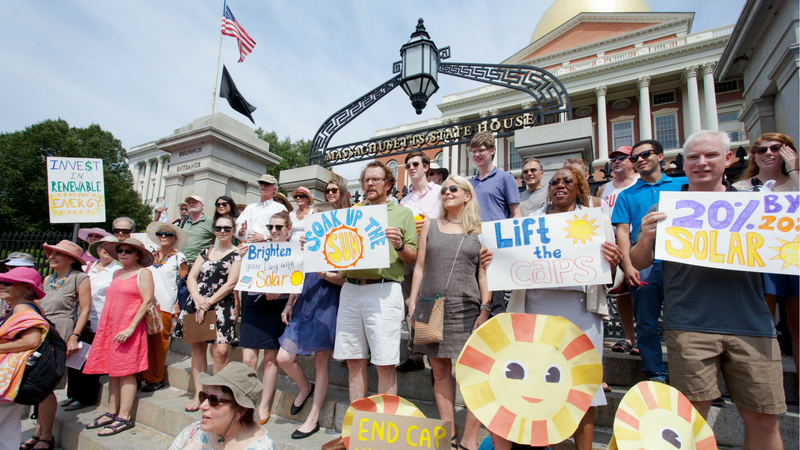 Massachusetts residents rally on the steps of the capitol in support of renewable energy. The legislation, introduced in the House of Representatives by Representatives Sean Garballey and Marjorie Decker, and in the Senate by Senator Jamie Eldridge, establishes targets for Massachusetts to meet its electricity needs from renewable energy by 2035 and all of its energy needs, including heating and transportation, from renewable sources by 2050. The sponsors deserve tremendous credit for their leadership. They have joined the growing number of stakeholders and leaders who recognize the need for a rapid transition to clean, renewable energy to tackle our environmental challenges. With a can-do attitude, powering our state entirely with clean, renewable energy is as feasible as it is necessary. Growing environmental concerns coupled with declining costs have made renewable energy the “go-to” option for many communities and businesses. Dozens of major corporations, ranging from Google to General Motors to Walmart, have already committed to a complete shift to renewable energy. Similarly, dozens of local governments including San Diego, California, St. Petersburg, Florida, and Georgetown, Texas have plans to go 100 percent renewable. Despite tremendous progress on renewable energy in recent years, we have a lot of work ahead of us. With the Trump Administration and Congress intent on taking us backward, we’re counting on our local and state governments, along with businesses and other institutions to lead the way by setting their sights on 100 percent renewable energy. In addition to the campaign in Massachusetts, Environment America and its partners are planning campaigns to get other states to go 100 percent renewable. Starting tomorrow, we’re launching an effort to persuade America’s colleges and universities to make similar commitments. We know that getting to 100 percent renewable energy is feasible — and that’s a good thing, because failure is not an option. We’re committed to making it happen wherever and however we can. We hope you’ll join us. Interested in working for us? Apply today. List of sponsors and Twitter handles: Thank them for standing up for a renewable energy future!